A team of astronomers using one of the Keck telescopes on Mauna Kea has found evidence for cloudy weather on two failed stars. Both stars, 2M1404A and 2M1404B, are brown dwarfs, objects that have masses between that of Jupiter and normal stars. Since they are not massive enough to fuse hydrogen, they have cooled and faded into ‘failed’ stars. 2M1404B has a mass of about three percent of the mass of our Sun and lives with its slightly more massive sibling, 2M1404A, 75 light-years away in the constellation of Centaurus. While 2M1404A is shrouded in thick clouds, the cloud layer in 2M1404B seems to be breaking up into patches. Normally, the more massive a star or brown dwarf is, the more radiation it emits, so the team was surprised to find that 2M1404B emits 60 percent more near-infrared radiation than its higher-mass sibling. "While smaller discrepancies have been seen in three other brown dwarf pairs, the size of this anomaly is most easily explained by clouds breaking up," says Dagny Looper of the University of Hawaii, and lead author of the study, which has been published in the 1 October edition of the Astrophysical Journal. Images of the brown dwarf binary 2M1404AB taken at different infrared wavelengths. In the first image, the cooler companion, labelled B, is much brighter than the hotter companion, labelled A. However, at longer wavelengths, B is fainter. Image: Looper et al. As a brown dwarf cools to the point that materials such as enstatite and iron condense, thick globe-covering clouds are formed, rather like smog on Earth. This dust absorbs light, causing a brown dwarf to appear dimmer in the near infrared (at a wavelength of 1.2 micrometers) than it would without the clouds. But when brown dwarfs cool down even further to temperatures comparable to those observed in 2M1404B (about 900 Celsius), the clouds suddenly disappear. The resulting clear skies cause the brown dwarf to appear brighter at certain wavelengths. "The process by which the clouds suddenly disappear is still unknown," says Adam Burgasser, an assistant professor at MIT. "But similar brightenings have been seen in clear patches in Jupiter's cloud decks. There appears to be an interesting connection between the clouds on planets and the clouds on brown dwarfs." 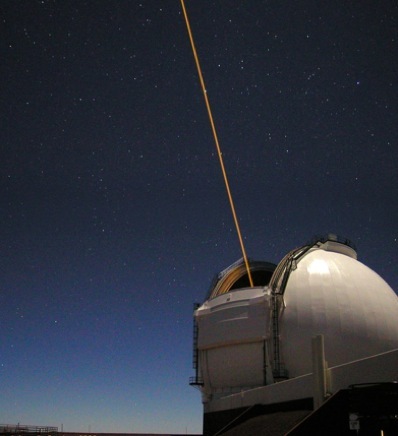 The adaptive optics system at Keck II uses a laser to calculate and account for distortions made by the Earth's atmosphere. Image: Adam Contos/W.M.Keck. The observations would not have been possible without the use of the adaptive optics system on Keck II, to lesson the blurring effect from Earth’s atmosphere and to resolve the closely separated brown dwarf binary pair, which would otherwise have appeared as a single fuzzy blob. The adaptive optics system uses a laser to create an artificial star by exciting sodium atoms 90 kilometres above the Earth’s atmosphere. Turbulence in Earth's atmosphere distorts the images of both real stars and the artificial star. The amount of distortion for the artificial star is measured several hundred times a second and sent to a flexible mirror that changes its shape to cancel out the effects of the turbulence in the real star. This provides astronomers with clear, sharp images down to a limit of about 0.04 seconds of arc. This new binary has a separation of just four astronomical units. “The adaptive optics system on Keck II is playing a crucial role in our understanding of brown dwarf physics, especially with discoveries like this one,” says team member Chris Gelino of the Spitzer Science Center at Caltech.